spazaspace: Large Hadron Cathedral (LHC). On a cold and rainy spring day, I arrived at around 6:30pm at the AIMS institute nearby to attend a talk given there on the LHC. After passing the security barriers, I was let in by my friend Andy who works there and had invited me to sit in on the talk. The classroom is quite bare, filled with desks and blackboards, painted that ugly yellow that schools seem to have an abundance of. While tinkering with uncooperative computer equipment, the classroom filled up with mainly young African men and women, and soon the show is on the road. What is the HLC, and why do we need it? This is the largest scientific experiment ever taken place in the world, so it must be good! It has been planned since the 80's and will run for 20 years, at a total cost of around $6 billion dollars. Which, as was pointed out, is far less than has been used by other sciences, like biotech, etc. How often one finds that argument being used in such cases. It is like two brothers arguing as to why the one should or shouldn't get such privileges. Why, one could ask, does it make it ok to use $6b on this project because it is less than the $10b used by the biotech industry or the untold billions wasted by the Defense Industry, than for a water project for those who are dying of thirst? It is a fine line of tension we walk between such issues. Though the HLC will probably finance a lot more erudite PhD's than would a $6B water project! We begin by taking a tour through modern physics. As we all know, physics is about the HOW of things, not the WHY. The latter being the abode of religions. So a large part of physics then becomes tracking and mapping data, almost like a glorified accountant. The difference is that its goal is to find simple ideas that describe large sets of phenomenon. For instance, gravitational equations explain both the apple dropping to the ground and the moon orbiting the earth. That makes it "good physics". The principle is reductionist: few ideas needed to explain many seemingly disparate phenomena. What I find strange is this: I know that the effect of the apple falling and the moon circling the earth, plus all that is affected by the two events, are very different, so why if the physics of two disparate events are the same, does it make the event seemingly the same? Perhaps that is a different science, and I am confused. But what is fascinating here is that they are both falling, which is only evident from the exactness of the scientific explanation. We know that space-time is bent. Perhaps it is also falling, just like the apple, or just like the moon. However, it is such a vast scale that we cannot see the epicenter. In the end then, the holy grail of physics is to find the Unified Field Theory: the idea, the set of equations, even one equation, like e=mc2, that will explain everything! That somehow seems awfully monotheistic to me. In fact, we already have an idea of that nature: we call it God, or Allah, or Buddha, or Tao, Great Spirit, the Holy Trinity, Adonai, etc... That we don't have a single name for it, does not mean it is not a single idea, an idea that encompasses all of creation. But let's get to some physics. We know that Electricity and Magnetism are interrelated, and have identified their basic component – photons - and their behaviour. We find the weak nuclear force, is of a similar ilk, and we call it the electro-weak force. 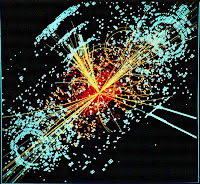 Its particles are called bosons, of which we have the W(+/-) bosons, the Z-boson, and the Higgs boson. All of which we have identified, except for the Higgs boson - and we will come back to that later. Briefly, Thompson discovered the electron at the turn of the century. Although the electron is most elusive, it is also the one we are closest to, in that it is at the base of all chemical reactions, and is the particle that participates in the most visible interactions around us. With this discovery, everyone thought that that was the smallest piece of matter, the Greek "atom". So, Rutherford, decided to do an experiment with alpha particles to show this. He bombards the atom with these particles, and, as expected, reads them as they pass through to the other side. Satisfied with his results (which point out that either he was a shoddy researcher, or the instruments that they had in those days were insufficient to be able to register the difference), he was busy working on new experiments when, as the story goes, he was approached by an eager graduate student asking for something to do to further his studies. Rutherford, trying to keep him busy and off his back, suggested that he take the instrument that was reading the alpha particle radiation and walk all around the center taking readings continuously. This was, actually, a brush off. He expected the student not to come back with any results as he was convinced at that point that the atom consisted entirely of electrons. The thing about the alpha particles is that they are fairly heavy and thus pass through electron clouds with the same ease with which we pass through a gas. Anyways, the student, who did not have such preconceived ideas, actually noticed that there were readings on the other side, the side of the source of the alpha beams. That meant that some of the alpha particles were encountering something solid and being reflected back. Like a tennis ball hitting a wall. And now Rutherford is named as the "discoverer" of the nucleus and proton, with nary a mention of the unknown graduate student! So now we had a basic description of the atom - with it's electron and its nucleus. However, out of this mix, other elements arose. When the theorists were dealing with the mathematics, they came out with both a positive and a negative solution to their equation. So they proposed a positron - which is an electron, except that the electron has a negative charge and the positron has a positive charge. Then there emerged the neutrinos - electrons, except that they did not have a charge (one could think of them as space fillers). And of course the anti-neutrino, a positron in all but charge. From all of this complicated mathematics, particles began to fall like snow in winter. Out came the muons, with the same charge as the electrons, except with a greater mass, and the pions, also same charge but heavier mass, though these beasts had something to do with what had become known as the "strong nuclear force". Each of these particles comes with their family, the anti-particle, and their respective neutrinos. Every particle is part of a cluster of these four elements – the particle itself, its anti-matter particle, it’s neutrino and its anti-neutrino. Let us digress a moment before continue with this neat model of the unknown realm of quantum physics. There is a story of science investigating the lobster catch in Maine. For the last 20 years the scientists have been saying that the catch is declining, while the fisherman are saying that it is healthy. The scientists were then lobbying for changes in regulations, and were getting heard by the legislatures. Then came a new breed of scientists who actually went amongst the lobsters, did field research, and collaborated with the fishermen in their research, and came out with a totally different idea of how the lobster lifecycle works and what its model is. So, this makes me wonder how accurate this model could be when we have no quantum fishermen to tell us what is happening on the "ground" in the sub-atomic field. Well now the Standard Model consists of two classes of energy, the Leptons and the Hadrons. The Leptons are the energy fields of the quantum arena, and the Hadrons are more the actual ripples or particles within these fields. For Leptons, we have the electron, the muon and the tau, each one heavier than its predecessor. The Hadrons are made up of quarks, of which there are 3 flavours: the up/down, the strange/charmed, and the bottom/top quarks, each successor being heavier. These quarks make up the particles that are the protons & neutrons - which are made of baryons, containing 3 quarks - and the pion - which is a meson containing 2 quarks. Once we include their anti-matters and their neutrinos, we have quite a buffet. What we are essentially looking at is all light, i.e. elecro-magnetic energy, which in itself is just a wave. Physicists talk in terms of fields like the electron field which exists and spreads across the entire universe. In this field arise ripples, which form the particles that we can measure to some degree. And the Higgs boson is thought to be fundamental to the mass of all particles. The Higgs field being like glue that holds them together. Some particles stick to it and get a mass, others don't. And now we come to the crux of our dissertation. Through our experimentation we have managed to identify all the particles of the standard model except for the Higgs boson which either doesn't exist or is too heavy to be seen. That is why we needed to build an accelerator that was big enough and powerful enough to register this boson!! Thus we now have the LHC. Essentially what they are doing is taking two clumps of atomic material, spinning them around for a while in a small chamber so that they can build up speed, then sending them out onto the wider track of 27 km until they collide. At the point of collision they are hoping to dislodge a Hill’s Boson and thus the Standard model will be complete. But, more importantly, they are hoping that out of this collision some other, as yet unknown particles might appear. It is like throwing two balls of matter at one another, just a way of doubling the impact speed, and then doing forensics on the collision. Well, one could ask, what else is there for them to find. If the Standard Model is correct, it covers all matter, right? Actually wrong. The matter we "know" only consists of 5% of the matter we have measured around us. 95% of the matter of the universe is dark matter, and we have no way of knowing what it is or anything else about it. We only know of its existence due to anomalies in measurements, due to certain vectors not arriving through spaces that, to our knowledge, are empty! So like children, in our frustration, we smash two pieces of matter together, hoping that if the impact is powerful enough maybe it will reveal some of its secrets. A little like extracting information through beating up the potential informant. Only, I don't think we can really upset or create enough fear in these little demon particles. We might get a surprise at the amount of power they can release – after all, we have always been told that to be completely single-minded, to focus your whole soul and mind and heart combined with pure intention, is immense power. This brings us to the episode of the Doomsayers. Those that say this could precipitate the end of the world. Of course all the physicist say that this is perfectly safe - nothing untoward can happen, and these are all just irrational fears. However, be that as it may, which famous scientist said, "Anyone who says he understands quantum physics doesn't know what he is talking about?" What about the irrationality and paucity of our knowledge in the arena of quantum physics? Can anyone say the he or she really knows what is going on in that sub-atomic realm? Think of how much energy of the atom is released in a nuclear explosion – and that is only a minute percentage of the energy trapped in the nucleus. And what of Dark Energy - how much of that energy is unaccounted for in the universe? With the same faith that enables us to get up in the morning, and face the day fraught with potential illness, violence and disruption, we march innocently into these places. It actually reminds me of God’s promise after the floods that She would ensure that the seasons continued and that this event would not occur again. String theory has managed to explain a lot of the phenomenon, and holds, according to some physicists, the most chance of being a theory of everything. 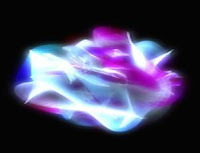 It requires 10 dimensions though, which makes me think of the 10 sefirot of the Kaballa. Another question in the realm of matter/anti-matter asymmetry is why can we only see matter and not the anti-matter? Perhaps anti-matter is indicative of the spirit world, which we know is there, but most of us cannot see, unless we have been “educated” to understand some of the “science” and “mathematics” behind it. And finally, Einstein's cosmological constant, which he inserted into his general theory to make the results meaningful. It was discredited for a long time, and recently has re-emerged. The only problem is that the experimental values for this constant and the theoretical values do not mesh. In conclusion, ending on my God as the quintessential reductionist idea, which is the only idea worth spending one's life on, in my opinion, the lecturer pointed out that the inside of the chambers of the LHC are larger than many cathedrals. Suddenly, it went off in my head. These are our modern day cathedrals, that we have put as much ingenuity and creativity into as our fore fathers did for their magnificent edifices to the Divine as they perceived It. These are our efforts to understand and hold some piece of the Divine in our hands, in our consciousness. These are the cathedrals built in support of our modern idea of God, our modern reaching for that singularity, the one idea that will explain all of Creation. But since I can't really offer anything overly constructive on the science, I'll just use this opportunity to promote myself. So in order to keep everyone properly amused while they think of more things to say - be sure to read the hundred or so pages that I also have already managed to post elsewhere on the LHC. And may RHIC guide your way!